indicated to them by forensic evidence, that the murdered [sp] would have to have been partially covered in the victim's blood. Ken also contradicts the testimony of Tommy, Jim Terrien, and others who recount there having been a considerable amount of drinking going on during dinner at the Belle Haven Club. Littleton says each one of the older kids, including himself, had only one bottle of beer. This is a point which demands further investigation and clarification. Point blank, our investigator in Boston asked Ken Littleton who he believes committed the murder of Martha Moxley. Once again indicating he could be withholding significant intelligence, Littleton answered, "No comment." Pressing a little further, our investigator then asked if Littleton believed one of the Skakel's was responsible. Littleton's response, again: "No comment." Whereas Littleton has clearly been hesitant to direct any imputation towards Tommy, he has afforded Michael no such courtesy. In his interviews with our investigator, Ken continually expressed his feeling that Michael was both strung-out on cocaine and prone to sadistic behavior. Littleton concedes that he never actually saw Michael doing any coke, but learning from his own subsequent experiences, claims to now recognize certain symptoms of Michael's appearance and demeanor as having been consistent with habitual cocaine use. He made a number of references to the way Michael was, allegedly, using a powerful shotgun to shoot small animals with demonstrative, careless, and callous abandon, during the hunting trip on the weekend immediately following Martha's murder. He also recounted a time when, allegedly, Michael bludgeoned a squirrel with a golf club while on a golf outing. Littleton claims to have been disgusted by Michael's behavior. He also suggested a few times, through questions, speculation, and intuitive supposition, that Michael could have been involved in the murder--which Littleton suspects was committed later than investigators believe. 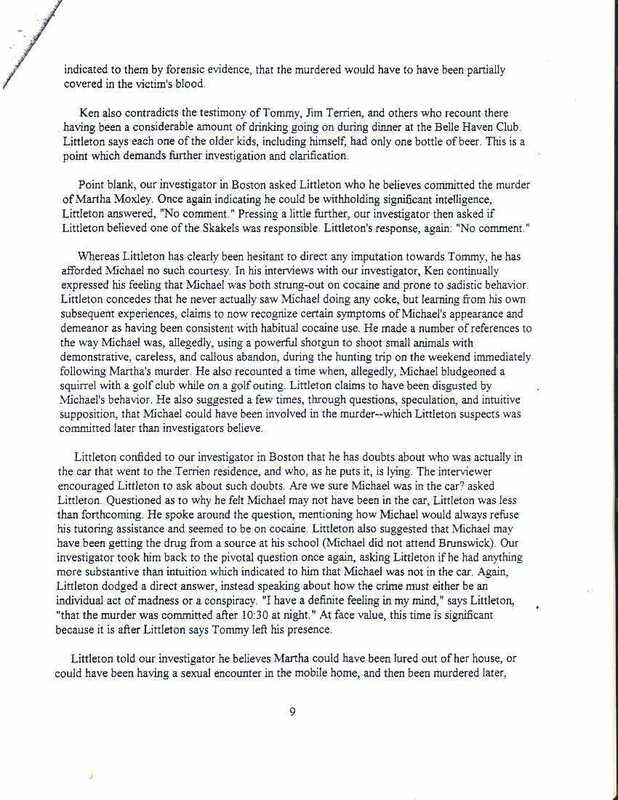 Littleton confided to our investigator in Boston that he has doubts about who was actually in the car that went to the Terrien residence, and who, as he puts it, is lying. The interviewer encouraged Littleton to ask about such doubts. Are we sure Michael was in the car? asked Littleton. Questioned as to why he felt Michael may not have been in the car, Littleton was less than forth-coming. He spoke around the question, mentioning how Michael would always refuse his tutoring assistance and seemed to be on cocaine. Littleton also suggested that Michael may have been getting the drug from a source at his school (Michael did not attend Brunswick). Our investigator took him back to the pivotal question once again, asking Littleton if he had anything more substantive than intuition which indicated to him that Michael was not in the car. Again, Littleton dodged a direct answer, instead speaking about how the crime must either be an individual act of madness or a conspiracy. "I have a definite feeling in my mind," says Littleton, "that the murder was committed after 10:30 at night." At face value, this time is significant because it is after Littleton says Tommy left his presence.